Havana Rum, Cucacao liqueur, Chilli Infused Sugar Syrup, Lemon Juice, Apple Juice, Mint Bitters. 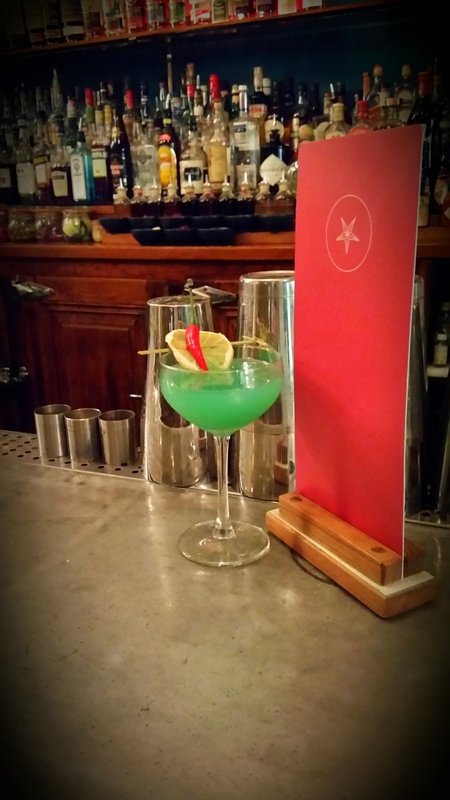 This month the team at Drury Buildings provides an alternate remedy for the grim weather outside, playing with taste and colour to bring you their new cocktail, The Antidote. A unique blend of spicy and fresh, balances the white rum with chilli infused syrup and mint bitters, all with an apple like texture. Let’s bring a bit of colour into our days and greet the spring with some colour in our glasses as well. Enjoy! Drury Buildings is a modern Irish cocktail bar and restaurant with an Italian influence, situated in Dublin’s hip Creative Quarter. Winter is here and we have one of the few covered and heated outdoor spaces in town – the comfortable seating and open-plan garden make it perfect for afternoon lunches and get-togethers after work. A must is our chef’s Saturday and Sunday brunch – served from noon. Alternatively, choose from the Lunch a la carte menu or enjoy a lovely dinner in our upstairs Restaurant & Balcony overlooking the Garden. If you try our recommended cocktail this month, make sure you tell us on Facebook, Twitter or Instagram – and don’t forget to tag The Taste!